Eastern Memorials, proud sponsor of this cemetery. Now accepting VISA, DISCOVER, MASTERCARD and other major US cards. In-Ground creamation burial $1500.00 in specified rows only. Full payment is due upon signing of the sales contract by cash, check or major credit cards. 48 hour notice required for marking. Next day burials are not guranteed and are only scheduled with the authorization of staff! 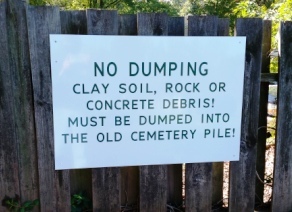 The Cemetery Company does not have the capability to open and close graves. The Funeral Director can help you select a professional company. Prices range from about $600 to $1500.